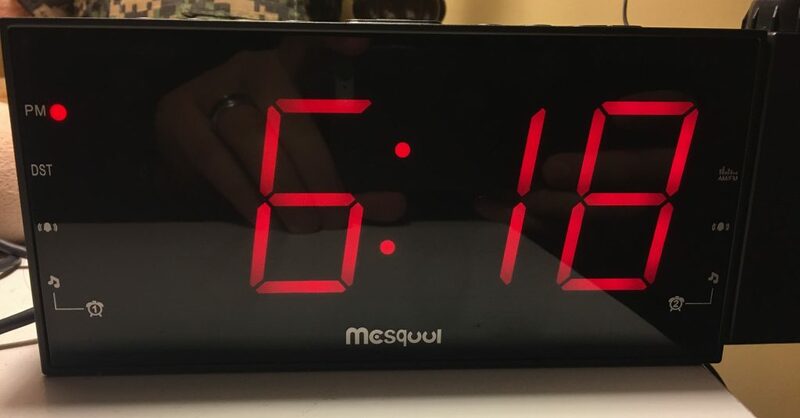 Over that past few weeks, I’ve had the opportunity to review the Mesqool Digital Projection Alarm Clock with a 1.8″ LED display, AM/FM radio, USB charging, dual alarm, and battery backup. The projection feature of this alarm clock allows you to display the time on your wall or ceiling which makes it easier to see than looking at the alarm clock itself. For the price, this alarm clock my Mesqool gives you some nice, but basic functionality. To take advantage of the battery backup feature, you’ll need to supply 2 AAA batteries, as they won’t come in the box. One small note about the battery backup feature is that the alarm clock won’t display the time without AC power. The battery backup will keep the time and settings saved in the case of a power outage, but you won’t be able to see the time until power is restored. Setup of the Mesqool Digital Projection Alarm Clock is straight forward. You push the Time button, then set the Hour and Minutes with the appropriate buttons. You can set the dual alarms with their buttons, and the front display shows whether you have it set to the radio or buzzer. The Alarm 1 shows on the left and Alarm 2 shows on the right. The AM/FM button will cycle through AM, FM, and Off functions. As you can see from the image above, most of the buttons have multiple functions. The Hour and Minute buttons also function as the Tuner buttons to surf the AM/FM channels. The Alarm 1 and 2 buttons double as the Volume buttons as well. You can use the button in the middle to turn on the radio and set a timer that will auto-shutoff the radio after a set amount of time. The projection swivel also has a focus knob which will allow you to adjust the clarity of the clock while displayed on your wall or ceiling. You can also click on the Projection button to flip the display of the time if needed. While this alarm clock serves its purpose, there’s a few places where it could use improvements. While there’s a dimmer button, the projection is always very dim. The speaker for the AM/FM radio can get loud, but can sound tinny and high pitched. There’s not much depth to the sound. As I mentioned earlier, the battery backup doesn’t keep the clock displayed, but it will save the settings. It would be nice if the clock could still be displayed during a power outage. Unfortunately, there’s also no way of listening to your phone or iPod/MP3 through the alarm clock. It offers a USB port for charging your device, but you can’t use it as an audio input. Even though there are some features that would be nice additions, this alarm clock still offers good functionality for the price. The time projection is actually a very nice feature. At first, I thought it would be a gimmick, but it does serve a purpose. Purchase the Mesqool Digital Projection Alarm Clock today on Amazon!